Just as I'd completed a review that was partially a commentary on how weary I am of "angry" reviewers on the internet it's time to review this stinker. I'm not going to get angry. It's not for me to say that Sega ought to be ashamed of itself for pimping out its wares to anyone who waves a tenner at them. However it is the job of this website to review these defunct old games and give them a fair and balanced assessment. Let's try to find some positives then. Well, the menu has a nice authentic feel to it. 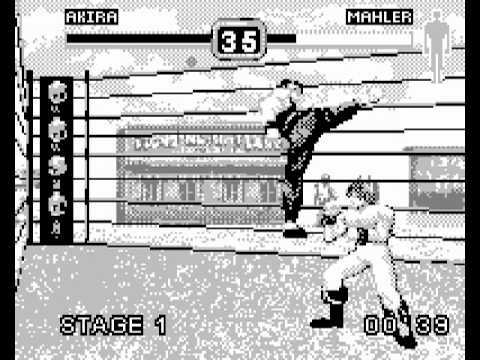 There are eight characters available to chose from culled from Virtua Fighter 2 and Fighting Vipers. There are also four "hidden" characters to unlock by beating each of the games four pathways. While the music is, for the most part the dreadful Game Com fare served up in other games, there is some nice digitised speech and a sample of the Saturn game's victory music when you defeat your opponent. In-game sound effects are fairly meaty and it's easy enough to make out everything that is going on. Fighters Megamix is simply dreadful. Interpreting the original Saturn outing as a 2.5d fighter (you can sort of dodge to one side in a jerky rotation of the screen) it makes a variety of token efforts at tricking you into thinking it might be playable. The sprites themselves are distinct and the FV pugilists still shed their armour as you hit them. There are a handful of different backgrounds, although all of them are behind the electrified grid of Fighting Vipers, which somewhat spoils the view. That isn't too important though since you won't spend too long looking at it for the five minutes it takes you to beat each route as you hammer down and kick to quite literally sweep your way to victory in seconds. "Can you find all the special moves?" asks the manual? Nope, we couldn't find a single one but how nice of the manual to neglect to do the one job it should have had and tell us how to perform them! Presumably there ARE actually special moves in the game as the cpu will occasionally bust them out during one of the moments that you've stopped sweeping out of boredom and kill you by spamming them for five seconds flat. 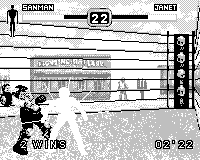 ​The Game Com's arbitrary high score is saved via the game's second option, a 'survival mode' where you attempt to defeat an endless number of enemies with one health bar, including the immediate appearance of the "secret" unlockable characters, who are also revealed on the character portraits of the regular mode and on the back of the box. Bravo, Tiger! Bravo! There is allegedly a 2 player mode that might somewhat improve the experience (!) if you can find anyone else in the world who wants to play against you and happen to own the elusive compete com cable required to do so. While other Game com games have been judged harshly in our eyes, by critics over the years, this is not the case with Fighters Megamix. it's not simply guilty of being an inappropriate port of a game that is too advanced for the system that birthed it, it's simply a terrible game with zero challenge, the lifespan of a mayfly and the lingering appeal of Donald Trump in a mankini. See, I didn't get angry at all.